This interesting name has two possible origins, the first and most likely being from an English locational name deriving from places called 'Saxoby' in Leicestershire and Lincolnshire. The places share the same meaning and derivation, which is 'Saxi' or 'Saksi' farm', derived from the Old Norse 'byr', farm, settlement. Both Lincolnshire and Leicestershire were areas of major Scandinavian settlement, and many placenames remain to provide evidence of their influence. The first recording of the modern surname 'Saxby' from this source is that of Nicholas de Sxebi, in the Pipe Rolls of Leicestershire of 1200. The second possible origin of the name is from the Middle English word 'sakespey', from the Old French 'sacquespee', a nickname for someone quick to draw his sword, or a trainer in swordsmanship. 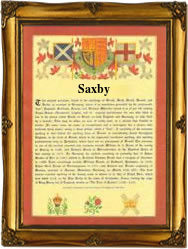 One Edward Saxby was christened at St. Antholin, Budfe Row, London, on January 11th 1551. The first recorded spelling of the family name is shown to be that of Jordan Sacheespee, which was dated 1183, in the Pipe Rolls of Yorkshire during the reign of King Henry 11nd of England and known as The church builder', 1154 - 1189. Surnames became necessary when governments introduced personal taxation. In England this was sometimes known as the Poll Tax. Throughout the centuries, surnames in every country have continued to "develop" often leading to astonishing variants of the original spelling.